The national emblem of France has been a symbol of the country since 1953. It is not officially the coat of Arms but it appears on French passports. A wide shield with the head of a lion and two letters, "RF". 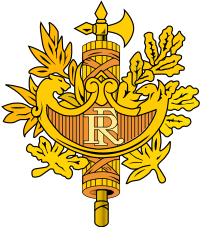 This means République Française (French Republic in french). A laurel branch that symbolises victory of the Republic. An oak branch that symbolises perenity or wisdom. The fasces is a symbol associated with justice (from Roman axes. This page was last changed on 9 March 2013, at 22:11.